In the last five posts we have been discussing closet upgrades – under mount slides, dovetail drawers, decorative hardware and the list goes on. Today, I want you to think about how many times you have installed a beautiful reach in closet behind noisy builder grade bypassing doors. Do you think if you had a program in place you could get 20% of those clients to buy doors from you? 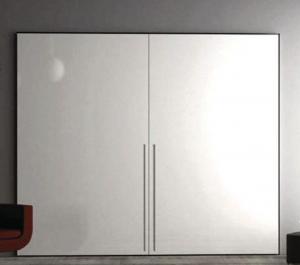 Let’s start with the competition – There aren’t many options for your client to buy new sliding doors. They could do a weekend project, buy the doors from Home Depot, and hope they are the right size. I don’t think someone that just spent a couple of thousand dollars on closets really wants to do that. Sure, they could try to find a reliable contractor (good luck) and have custom doors made. Again, I don’t think most people want to do that and it would be expensive. If there is a Sliding Door Company in your market, they make beautiful glass doors and are a great solution. Except they are expensive and there is a long lead time. So, you can see there really isn’t much competition. Offering your clients sliding doors gives you an opportunity to increase your average sale, and helps you differentiate yourself – as a total solution. 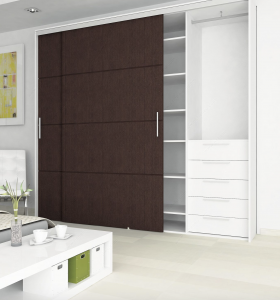 Richelieu Hardware offers sliding door hardware solutions to fit every budget and application. We even have a team of technical specialists that can help you decide which system is right for you. If you are just getting started I have a three “go-to” systems that should cover the majority of your applications. 89DCD2M – This is a top hung system that will hold 99lbs per door and all the hardware is surface mounted which makes it very user friendly. Band a ¾” panel, add one of our oversized handles to the door and you easily just added $1000 to the total sale of that installation. 89CD40CX – Don’t want to hang the doors off the header? Building a built-in wardrobe or a garage cabinet? The CD40 could be the system for you. This is a bottom rolling system that features adjustable bottom rollers and a top guide for smooth travel. PL2550 – Does your customer prefer full access to the closet? The PL2550 is the perfect solution. It’s a bi-fold door system made for ¾” panels. Only drilling required is one 35mm hinge hole, everything else is surface mounted. It also features a top track and carrier that will prevent any door sag. Are you a little more advanced? Our co-planar door hardware is the best on the market. 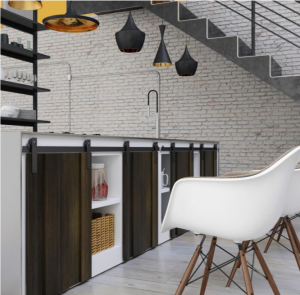 Co-planar hardware is a by-passing door system that when closed, the doors are flush – keeping a consistent reveal that most high-end clients are looking for. Have your clients asked you about barn doors? 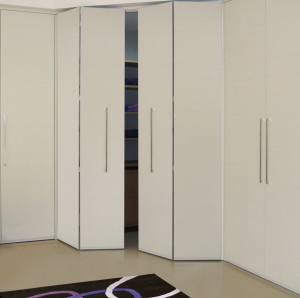 We stock options for 19mm cabinet doors and full-size doors in various designs to match any home décor. We can even supply you with barn doors! If you would like more information about our sliding door offering please visit Richelieu.com – here is a link to our sliding door selection wizard or reach out to your local Richelieu rep.
Are you currently offering sliding doors? 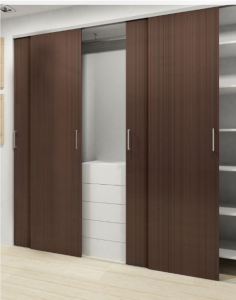 You go into a client’s home and they walk you into their bedroom to show you their closet… How many times have they opened the sliding door and it sounded like a garbage truck was driving by? Now your client has newly organized closets behind these old noisy sliding doors… how long before they change them? Will they call you? Or another company that advertises sliding doors? The majority of my customers will not install sliding doors and I’m not sure why… It’s easier to increase your sales with an existing client than get a new one, and yet most of my customers don’t offer doors. In these times when everyone is fighting for jobs and there doesn’t seem to be a bottom, doesn’t it make sense to provide your client with a service – like getting rid of those old noisy doors? 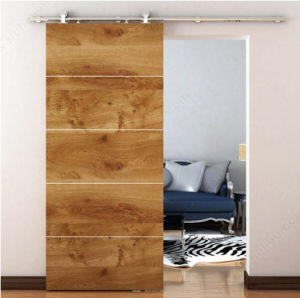 There are many varieties of sliding door hardware on the market. From bi-passing doors to room dividers your local distributor should have hardware suitable for your needs. You will need to provide them with the material of your door, the door thickness and the application. If you would like more information about sliding doors or any other hardware please contact me at richdemarco@optonline.net.